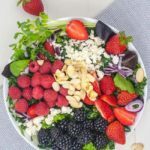 FThis Triple Berry Mixed Green Salad with strawberries, blackberries, raspberries, feta cheese (or goat cheese) and toasted almonds is perfect for a potluck, deck party or any occasion. 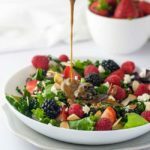 A fresh and tasty spring and summer salad with a creamy balsamic dressing that always gets devoured! This Triple Berry Mixed Green Salad is a classic recipe that everyone seems to love. With a creamy balsamic vinaigrette, a smattering of feta cheese and a few crunchy toasted almonds, it makes a complete lunch or a delicious side salad. Lately I’ve focused on including more berries in my diet, as they are such a powerhouse of nutrition. Strawberry season is on the horizon and the hummingbirds are already fighting over the blossoms on the raspberry bushes in the garden. Next up on my list of salads to make will be one of my favourites: Strawberry Cucumber Salad with Creamy Lemon Dressing! 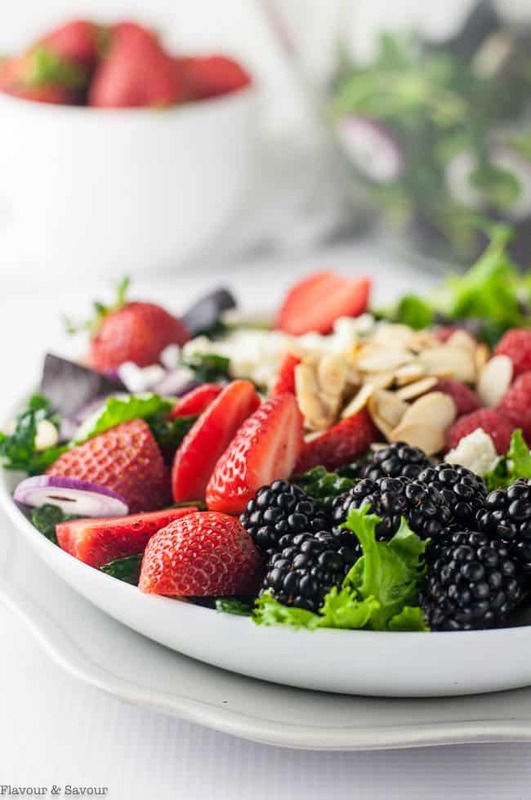 Berries are so easy to add to a salad. They make a great contrast in colour and texture when tossed with mixed lettuce and kale. They’re delicious added to smoothies and shakes as well. When baked in these Mixed Berry Baked Oatmeal Cups and served with kefir or yogurt, they round out a delicious breakfast. Why should I eat more berries? Berries are a low-sugar fruit, so they’re better for stabilizing your blood sugar levels than high-sugar fruit like grapes or pineapple. They’re an excellent source of fiber so they’ll keep you feeling full and help improve your digestion. Their bright colour shows they’re loaded with antioxidants to boost your immune system. Berries are full of essential vitamins and minerals. They’re so versatile. Berries are delicious in both sweet and savory recipes. Raspberries, blackberries, blueberries, and strawberries seem to be the most popular berries, but I also love Saskatoon berries and huckleberries. I had planned to make a kale salad today, but the kale I had could definitely not be described as tender. I massaged it, then added some mixed greens instead before topping the salad with berries, feta cheese and almonds. Begin by removing the leaves from the stems either by slicing them out with a knife or running your fingers along the stem to strip off the leaves. Discard or compost the stems as they are tough and fibrous. Then finely chop the kale leaves and transfer to a bowl. Add a teaspoon each of olive oil and lemon juice. Massage with your fingers for 3 – 5 minutes, making sure all the leaves get your special touch! Once the leaves seem to be softer and slightly wilted, add the remaining salad ingredients. Taking the time to prepare the kale this way will make a big difference to your salad. Shake the dressing ingredients together in a Mason jar, or use a blender or an immersion blender to combine them. This dressing will stay emulsified for 30 minutes or longer. The yogurt is optional, but it makes a creamy dressing and tempers the tang of the balsamic vinegar. If you’d like a thinner dressing, add a couple of teaspoons of water. 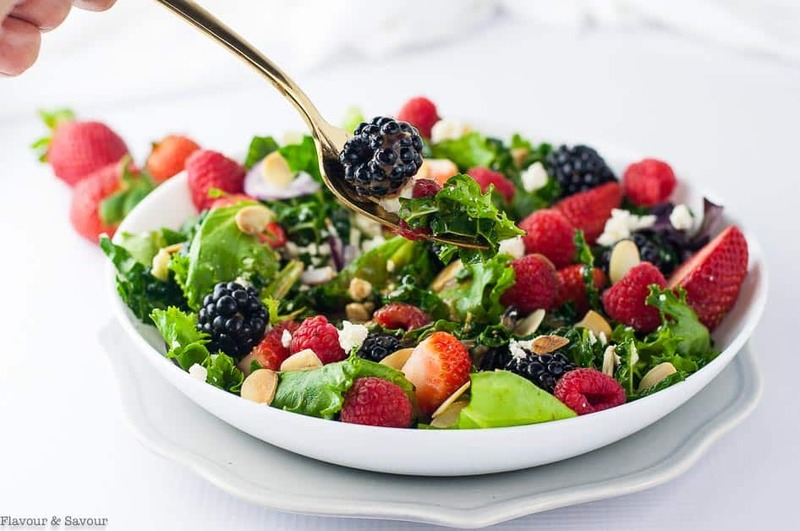 Colour, texture, salty feta and naturally sweet berries make this berry salad recipe a keeper! 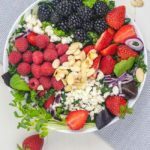 This Triple Berry Mixed Green Salad with strawberries, blackberries, raspberries, feta cheese (or goat cheese) and toasted almonds is perfect for a potluck, deck party or any occasion. A fresh and tasty spring and summer salad with a creamy balsamic dressing that always gets devoured! Wash kale leaves and remove center rib. Finely chop and transfer to a medium bowl. Massage with 1 tsp olive oil and 1 tsp lemon juice for 3 - 5 minutes or until it has started to wilt. Add remaining washed and dried mixed greens and red onion. 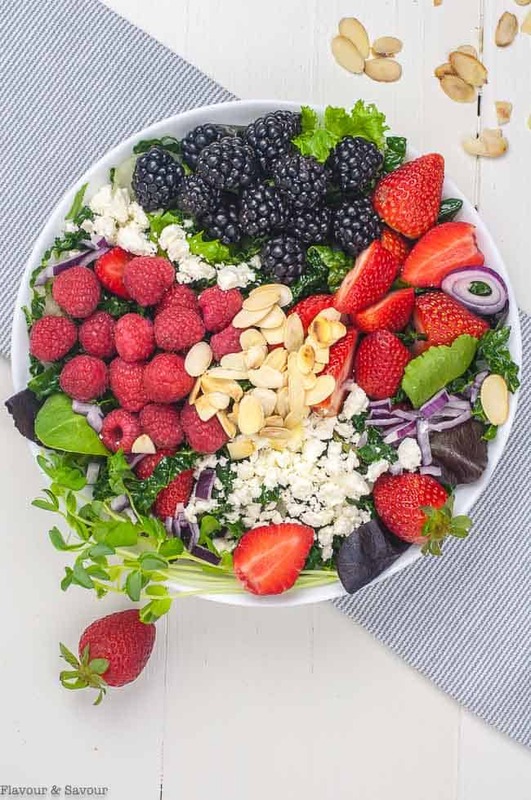 Arrange berries, cheese and toasted almonds on top. Shake the Creamy Balsamic Vinaigrette dressing ingredients in a Mason jar or combine with a blender. Serve on the side. That looks so fresh and delicious on a hot summer night! Drooling here! Beautiful salad, and feta taste good with anything, so this is great! Berries are my favorite! I love to add them to my baked goods, but also in salads, they are awesome. And your salad is a fantastic example. Beautiful looks and wonderful flavors. The goat cheese would pair so well with the overall taste! This is a beautiful salad Elaine! 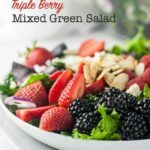 I make a similar version to this and it’s my go-to salad in the summer! 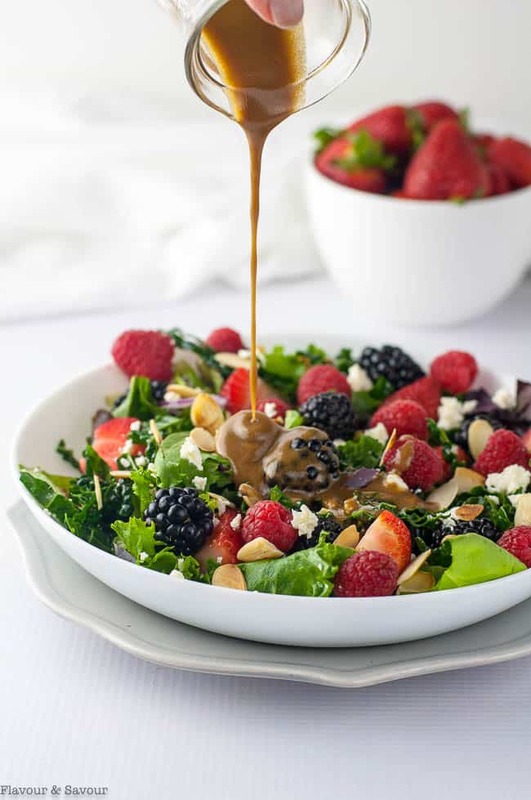 There’s something about berries, feta and balsamic that’s so delicious and refreshing! Happy weekend! Thanks Leanne! Agreed–this salad has a great sweet and salty contrast that we love. I love the berry goodness on the plate. Looks so colourful and beautiful.